Illesteva is an American accessories company founded in 2009 to fulfil a need for classic eyewear with a downtown New York aesthetic and since their launch Illesteva have expanded to include umbrellas and bags. What we like about Illesteva products is that they have been handcrafted from the highest quality materials in family-run factories throughout Italy, France and Germany. 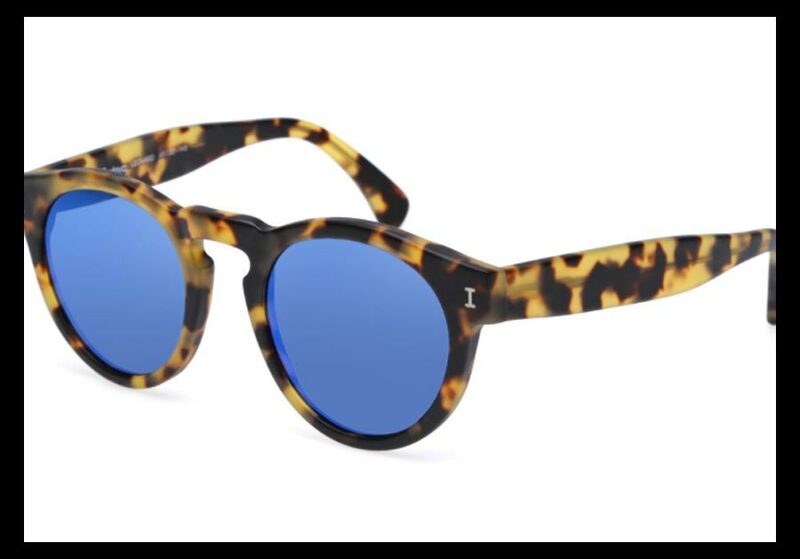 We love their impressive ‘Leonard’ sunglasses in tortoise with blue mirrored lenses that offer classic timeless frames with coloured on-trend lenses. Not widely available yet in the UK you will be able to purchase these fine frames from two of our favourite online retailers End Clothing and Oki-Ni. I love these! Just purchased them online. I’ve worn only Oliver Peoples for years, and still love them. However, last year, in an attempt to acquire an attractive blue lens, I ordered a top of the line pair. The lens are suppose to be made in Japan, but when they arrived, you could only tell they were blue, if you put white paper behind them…. Very disappointed! Most excited to receive these, and for half the price! Your photos are excellent, look forward to receiving future posts.